GO CAPSI-SLIM 1-A-DAY is a weight management formula containing the clinically researched ingredient Capsimax® plus Garcinia and Green Tea. Capsimax® employs OmniBead™ beadlet technology to encapsulate the beneficial heat of concentrated natural capsicum in a controlled-release coating, delivering effective levels of capsaicinoids without the oral and gastric burning sensation of unprotected red hot peppers. Capsimax® helps support energy production and healthy metabolism, the mobilization of fats for energy production and thermogenesis. 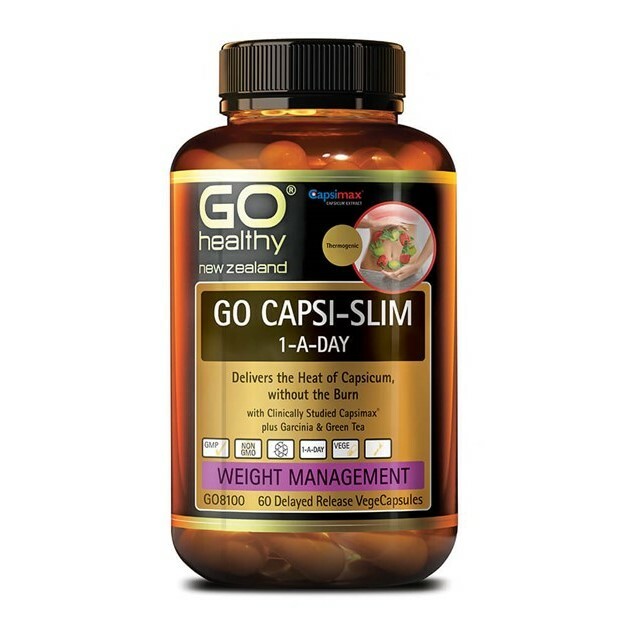 A multi-action weight management formula that supports metabolism, energy, healthy appetite and blood sugar levels, cravings and mood. Adults: Take 1 DR-VegeCapsule daily. Best taken at breakfast time with food. Or as directed by your Healthcare Professional. MEDICINE INTERACTION: Do not use if taking anti-coagulant or anti-platelet medications. If taking prescription medication or if in doubt consult your Healthcare Professional.